As a business owner, you’re probably getting nervous about the upcoming holidays. It’s not enough that you have to worry about staffing shortages, new overtime laws, or potential drops in sales during this time. You’ve also got to worry about how you’re going to protect your business from alcohol-related incidents. If you’re the owner of a “dram shop” (any establishment that sells or distributes alcohol, like a restaurant, hotel, or convenience store), liquor liability should be a genuine concern. And while it’s something you should be aware of and stay on top of all year-round, the holidays are a time of year particularly conducive to alcohol-related incidents. With the holidays fast approaching, let’s take a moment to discuss liquor liability. Respondeat Superior: This law says that employers are legally culpable for any actions their employees take during their tenure. For instance, if one of your employees got into a fight with a customer, you can be held responsible. Dram Shop Laws: These vary from state-to-state, but they all basically say the same thing. If alcohol proves to be the reason for an incident (and this could be a car crash, bar fight, injury, sexual harassment, etc. ), the commercial establishment responsible for providing that alcohol can held responsible. It doesn’t matter if it’s your alcohol, alcohol you allowed people to bring in, or alcohol served by a distributor. If it’s from your place of business, you’ll be at fault. Commonplace Negligence Laws: Basically, if you or one of your staff is found to have acted negligently in the serving of alcohol, you can be held guilty for any ensuing harm or damage as a result. In other words, don’t serve minors or overserve. Remember: these laws aren’t in place to make you out to be the bad guy. These laws are here to put the proper stopgaps in place to keep liquor-related accidents to a minimum. According to the CDC, the United States loses nearly $250 billion each year due to “drinking too much”. If that’s what it costs the country, imagine what your share of those costs are in the form of lawsuits, healthcare, repairs, productivity, and more. Here are some of the more common forms of alcohol-related accidents that put businesses in harm’s way every year. When it comes to injuries like trips and falls, keep in mind that not all cases will result in your liability. 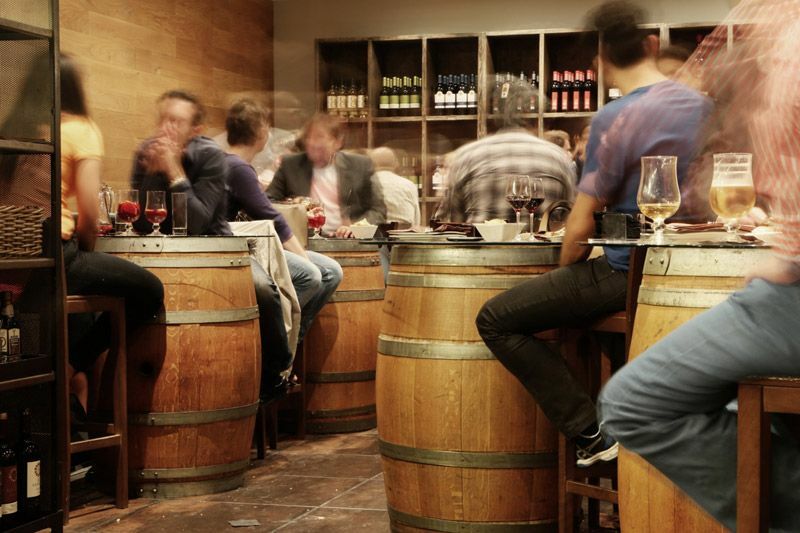 For instance, if an employee falls off a stool and gets injured while drinking with coworkers (but not at a work function or on your premises), then they are responsible. However, if an employee should go and push another employee down on the ground at a holiday party, that injured employee can hold you responsible. The same holds true for your customers. You should be especially careful for any negligence that may contribute to an injury, like food or liquid left in the middle of the floor. It may be the customer’s fault that they got drunk and fell, but if they find a spot of water there, you could be liable for their injury. Impaired driving doesn’t seem like something you can be held accountable for unless you’re in the business of delivering food, right? However, if the alcohol responsible for the accident was served by your business—whether to an employee or a customer—you can be held liable for any damage, injuries, or even deaths that result from an alcohol-related traffic accident. Alcohol isn’t referred to as “liquid courage” for nothing. That being said, if a fight is shown to have resulted from heavy intoxication (and not because your employee or customer wanted to fight on their own accord), your business may be at fault. This may be the last thing you’d think about, but it’s unfortunately one that does happen as a result of heavy intoxication. Sexual harassment is any form of unwanted sexual conduct, including innuendos, advances, requests for sexual favors, groping, and assault. If alcohol is found to have played a role in the harassment or assault, the blame may fall on you as the purveyor of the alcohol. As a dram shop, you want to be able to continue selling liquor, but you’ve got to ensure you do it responsibly. Liquor liability is a serious matter and isn’t one you should overlook until it’s too late. Don’t risk losing profits (or productivity) because you missed out on an opportunity to better secure your business. Know your state’s laws. Incorporate them into your policies. And train, train, train.